The District Attorney's Office had been completed and occupied well before Hurricane Katrina. Facing New Orleans from the south side of the Mississippi only some 25 feet from the levee, and despite the widespread devastation throughout New Orleans and Jefferson Parish, the building escaped structural damage. The north, river-facing side, lost its flashing and several penthouse panels, but overall the building interior suffered mostly from water damage and was occupied by staff members during the emergency. 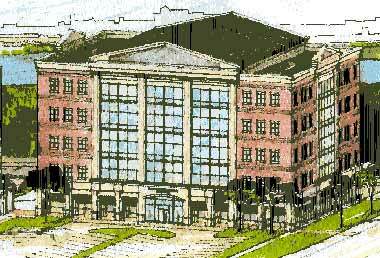 SERVICES: Evaluated the current office space, anticipated staff growth, and changes in office procedures. Suggested methods to fit the architectural program to the budget and a strategy for avoiding future problems. Continued to meet periodically with the department's leadership and the architect's staff and to review schematic, design development, and construction documents; attend project review meetings; and consult on design and budget issues. RESPONSIBILITIES: Provided the services as consultant to District Attorney Paul Connick, Jr.